This is the support page to all our products, including the Chess King Training series and the Chess King with Houdini chess software. ▶ Where should I install Chess King for PC? Make sure you install Chess King (for PC) in a directory in which you have normal admin rights, otherwise the program won’t be able to write to disk. More precisely, do not install Chess King in any Systems Folders, such as, 'Program Files (x86). ▶ Sometimes my Analysis does not complete. What’s wrong? ▶ When I upgrade to a new version of Chess King, can I keep my profile and rating? When you upgrade to a new version of Chess King, you can keep your profile by simply copying the XML text file from data\config\profiles into the same location in the new Chess King folder. It is also recommended to backup your PGN files in the data\Abases\PGN and also put it in the same location of the new program, then import any PGN files you wish to work with. There are false alerts or sometimes even outright bugs from Norton, Kaspersky, BitDefender or other virus solutions, and as soon as we see one we contact the companies to be whitelisted. The Chess King and Houdini 3 Setups from our web site are completely safe, they have been downloaded and installed by thousands of users. You should override the antivirus’ action (for example move the downloaded Houdini 3 Setup out of quarantine). Many antivirus solutions produce false alerts. To avoid these we recommend Microsoft Security Essentials, we think it is the best anti-malware solution available. It’s free, non-intrusive and integrates perfectly with Windows and the Windows Update system. When you upgrade your copy of Chess King (for example from Chess King 1 to Chess King 3), you only need to copy (duplicate) your own PGN files from the old Chess King to the new Chess King. It's also good to make a backup copy of your games in case something happens to your computer, your games database is precious. Go to the folder where your old Chess King folder is, and there is a "Data" folder in it, and it the "Data" folder there is a "ABases" folder. Inside the "ABases" folder you will have your PGN files (in the "PGN" folder), the ones automatically created when you play games, and the ones you imported and have been working on. Those files don't take much space at all (the GigaKing database is in the "cdp" folder in the "ABases" folder, so it is easy to copy them for example to a flash key for safekeeping. All you need to do is make a copy of the PGN folder and put it in the new Chess King at the same place (make sure not to replace if you have worked on the new Chess King and have files with the same names, in that case it's ok to rename the PGN files for example EngineGamesOLD.PGN . ▶ What are the available versions & differences in Chess King? We now have the following versions: Top of the line: Chess King 4 for PC, Chess King 4 Pro for PC, Chess King 4 for Mac. These versions include the top engine Houdini 4. For the PC we have versions with previous generations of Houdini at reduced prices, but with the same interface: Chess King 2 for PC and Chess King 3 for PC All have also the GigaKing database and opening tree, etc. All work with all versions of Windows incl. 8 and all are multilingual. Houdini 2 is a 1-processor engine, rated around 3200 (still stronger than all humans) Houdini 3 supports up to 6 cores and is rated about 3300 (a tiny bit faster since uses all cores) Houdini 4 supports up to 6 cores and is rated about 3400 (a tiny bit faster since uses all cores) Houdini 4 Pro supports up to 32 cores, but you need a super PC for that. Example: Kaspersky Anto-virus says there is a worm in CK3: PDM.Worm.P2P.generic Process (P.I.D. 66068) <--- This is a false positive, we have submitted Chess King 2 and Chess King 3 to all major virus protector companies and they have whitelisted our program in new virus definitions, so you should not get this warning if you have fresh virus definitions in your virus protector program. If you still get a warning from your virus program, first be assured there is no virus or worm in Chess King, we guarantee it, and please send us a copy of the warning so we can write and have Chess King whitelisted everywhere. ▶ Can you play with styles in the Game Notation Window? In Chess King 2 and Chess King 3, in the GAMES module, just select the database you want to save games to, then press the button just below "Add Game to selected database". Chess King on its own will never freeze, even when analysis is at full power. Freezes occur because of other program interaction, usually virus protectors. Turning the virus protector should always solve any freezing problem. ▶ How to I Setup a Position with FEN? Method 1:First put the FEN position in your clipboard. Example of the position after 1.e4 c5: rnbqkbnr/pp1ppppp/8/2p5/4P3/8/PPPP1PPP/RNBQKBNR w KQkq c6 0 2 Then simply in the setup window press the keys shift+insert and the position will be setup! Method 2: Highlight the FEN notation in a text editor and hit CTRL-C to copy it to the clipboard. Then in CK's database window, make sure you have the database loaded where you want the FEN position to end up and click "Add new game". When CK returns you to the Game window, right-click in the (empty) notation pane and select "Paste". ▶ My download disappeared! What happened? The file is big (about 1.7 GB for Chess King 2 and about 2.5 GB for Chess King 3), even with fast internet it can take 30 minutes up to 1 hour. With slower internet it can take much longer. Those are Gigabytes not megabytes. Depending on which version of Windows you have, either clicking the link will download the file to your "downloads" folder, or you may have to click "Save and Run" or at least "Save" to download the program to your PC. The file will be saved either to the default folder where all your downloads go or to the folder that you select when prompted by your PC. After the download step you should have in your computer a setup exe file, Those files are called either CK2_Unpack.exe or CK3_Unpack.exe depending on the version you have purchased. If you follow these steps you will be guaranteed to get Chess King 2 or 3 installed in your system. Don't hesitate to write if you have any questions. The file cannot disappear on its own. Either you downloaded it and you don't know where it is on your system, or you downloaded it but then installed it but can't remember where you asked it to be installed, or possibly you have a version of windows where you asked it to "run" the program without saving it, which may have not worked out, so nothing was saved. It's important to save the file to your PC so you can then unpack it then install it. Contact us if you have any doubts. ▶ How can I backup my chess games? It is a good idea to backup your personal database of games once in awhile. Look for it in the directory where you installed Chess King, in the subfolder "Data", then "Abases". When you upgrade Chess King to any new version, the data files are not replaced, so you should not lose them during an upgrade. It is nevertheless a good idea to back your game database up and move it off site in case you lose your PC for example or the hard drive dies. ▶ The interface of Chess King 2 and 3 is in which languages? You can change the interface of Chess King 2 and Chess King 3 to be in English, or Spanish, French, German, or Russian. More languages coming soon. ▶ Can Chess King 2 and Chess King 3 open ChessBase files? Yes. 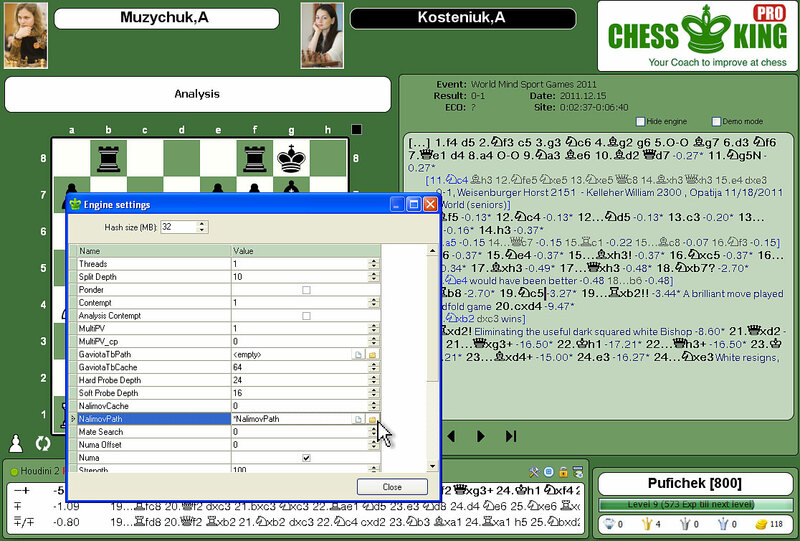 Chess King can any PGN files, Chess Assistant format files, and Chess Base format files. ▶ I just purchased Chess King 1 and you issued Chess King 2! If you bought Chess King 1 or Chess King 1 Pro after April 1, 2013, please contact us for a free upgrade to Chess King 2 or Chess King 2 Pro. You will need your serial number and proof of purchase including the date. ▶ How to skip puzzle levels in Chess King 2 and 3? Right click at the very top right of the Chess King logo at the top right of the window, then select up to what level you'd like to unlock. ▶ What is the difference between Chess King Max and Chess King Pro? The engine in Chess King 3 Pro is Houdini 3 Pro, which allows for up to 32 cores and 256 GB of hash. This if for pretty powerful chess computers with lots of RAM memory and allows faster and deeper analysis. ▶ How to import my training settings from Chess King 1 to Chess King 3? You can manually copy the file \Data\Config\Profiles\.xml to the similarly named directory of the new Chess King. Then start the new Chess King, click on the name of the user in the bottom right corner, and change the profile from the current to the imported one. ▶ On how many PC’s can I install Chess King 3? ▶ How can I register my copy of Chess King (1, 2, 3)? ▶ Is Chess King compatible with Zone Alarm Pro? Try setting the Windows taskbar properties to "auto-hide the taskbar", this may help. ▶ Do you have any video tutorials about Chess King? Yes, we have published 20 free video tutorials, have a look at the "Tutorials" Playlist on our YouTube channel "ChessKing". The list of topics covered is here. ▶ How can I install Chess King from the DVD? The Chess King DVD and installer should be automatically recognized in any Windows system, since it includes the file autorun.inf that calls up the installer. If for some reason your system does not allow the installer to start automatically, simply double-click the file ChessKing_Setup.exe and installation will begin. ▶ Can Chess King open .cdp databases? ▶ I get the message “Failed to download Updates”, why? Maybe you installed Chess King in a directory such as C:\Program Files(x86)\ChessKing\Data which is not allowed in Visata and Windows 7. You should rather install Chess King in a directory such as C:\ChessKing\Data or D:\ChessKingData and then all Updates will be installed automatically and without problems. ▶ I have Problems installing Chess King on Vista, why? We have a user base of 500+ installs, including many Vista PC's. What is important is that you have the official Vista Service Packs installed. We have not noticed any problems with a clean Window system with SP 1 installed. If you have some problems with the installation, make sure to let us know which exact Windows System you have (to find out, either press Win+Pause, or do Start | Run then enter "cmd" and you will see the exact windows version number which is on your computer, for example for Vista SP1 you will see Microsoft Windows [version 6.0.6001]). Tell us also in as much detail as possible what else is not working. Normally, if the installer starts, and you let it run fully to the end without stopping it half way, the program should install just fine. ▶ On how many computers am I allowed to install Chess King? You are allowed to put Chess King on any number of computers you personally own, including when you have a desktop and a laptop, or even if you have a PC with some version of Windows, and also a Mac with a visualization software like VMWare Fusion or Parallels. No need to buy a second copy, you can have Chess King running on both at the same time. In the future we will add cloud services, where you will be able to store your games, analysis, etc. in the cloud and access them in a variety of ways, but it will be through a registration that starts from the serial number, so you should be the only person with your serial number, so you should keep it in a safe place, to avoid 2 people logging in at the same time. Note that this applies for personal ownership of Chess King. Schools or chess training centers with several computers should contact us to get special conditions for multi-computer installations. ▶ In Chess King Pro can I edit (add, delete) the paths to my Nalimov Tablebases? ▶ In Chess King what is the purpose of “coins”? ▶ Is Houdini 2.0 for a 32bit processor or can I use the Houdini 2.0 64bit pro? The Chess King installer will install a 32-bit version of Houdini 2 if the computer is based on a 32-bit operating system, and a 64-bit version of Houdini, if the operating system is 64-bit. In other words, you're always sure to have the maximum power adapted to your computer with Chess King or Chess King Pro. We also guarantee the most recent versions of Houdini 2 for Chess King and Houdini 2 Pro, via auto-update. ▶ How do I start the engine? Just press the SPACE bar to toggle the engine ON and OFF. Note that you can see the engine working only in the analysis mode and obviously not in any of the playing or puzzle solving modes. ▶ Is the Houdini Pro the 2.0c version or does it need to be updated? Chess King with Houdini 2 and Chess King Pro with Houdini 2 Pro will always have the latest Houdini 2 version, via automatic auto-update. At the moment, the latest Houdini 2 release is the Houdini 2.0c, included in both Chess King and Chess King Pro. The difference between the standard version and the Pro is that the Pro uses all available processors and the standard Houdini 2.0c uses only one processor (that's still quite decent performance and recommended if the computer is not very powerful). In Chess King Pro, the Houdini 2 Pro also has a whole series of settings that can be adjusted, whereas in Houdini 2.0c standard, the engine is optimized to run with Chess King and the only settings that can be changed are the numbers of variations you want to see in the engine analysis box. ▶ What’s the difference between Chess King and Chess King Pro? The main difference is that the engine that powers Chess King is Houdini 2 Pro. That's a fundamental difference. For "normally powered" PC's with 1 or 2 cores, Chess King (with Houdini 2) should be fine and will manage all classical chess tasks just fine using just one processor. But for powerful PC's that have multiple cores, Houdini 2 Pro will take full advantage of all the cores and will make the analysis super fast and a tiny bit more powerful. Another difference is that Houdini 2 Pro handles play and deep engine analysis of Chess960 games, including correct castling, whereas Chess960 play and engine analysis is not supported with Chess King Standard. In addition, Chess King Pro includes an extra 685 MB file which is called giga_eval_setup.exe and adds a large opening tree with all evaluations pre-computed to save time. Chess King shows all the opening trees fully but without the evaluations. Houdini 2 Pro also allows you to control entirely the engine settings, including the hash and personalities. You can also attach the Nalimov Endgame TableBases to Houdini 2 Pro which is included in Chess King Pro. See a screenshot of the engine settings from Chess King Pro. You can upgrade anytime to Chess King Pro. ▶ Can Chess King use EndgameTablebases? Chess King Pro fully support Endgame Tablebases. With Chess King Pro you may setup the path to Nalimov tablebases using the TOOLS button a the top of the Analysis pane (the leftmost button). The Houdini Pro engine also supports the (more rare) Gaviota tablebases. Chess King standard does not support Endgame Databases, only Chess King Pro does. See the screenshot. ▶ Can you use Chess King on a Mac? ▶ Can you add an Opening Book to Chess King? Chess King includes a large opening book, which is capable of changing depending on the required rating (i.e. for analysis it's at the maximum, but to play at a weaker level it is modified not to follow book for a long time). It is not possible to include external opening books to Chess King. Note that there really is no need to do so, since the Opening book has been optimized for Chess King. ▶ How can I skip the easy puzzles levels? To go up levels very fast it's easy: all you need to do is play some "Random" games with some advantage such as "only" 25%, if you win, you will go up very fast, possibly straight to level 9. You go up levels from playing games, Quest games, or solving Puzzles. ▶ Is it possible to use several engines at the same time in Chess King? No, it is not possible. Chess King has been optimized to work best with the strongest engine available Houdini 2 or Houdini 2 Pro. ▶ Can Chess King use other engines for analysis or games? Chess King is optimized to use a custom version of Houdini 2 to maximize its power and speed. Chess King pro uses the most powerful engine Houdini 2 Pro. Note: if you really would like to use another engine, you could edit the file engines.xml file or simply rename the new engine. But we're not too sure why you'd like to do that since Houdini 2 is the most powerful engine available todate. ▶ Does Chess King work on Windows 7 64 bit OS? Yes. Actually Chess King works on all the Windows Systems we have tested, from Windows XP systems on, all the way to the most modern systems. The fastest Windows systems that have multiple cores are ideal for Chess King Pro with Houdini 2 Pro. You won't have any equal to the power of speed of Houdini 2 Pro in a strong system. Chess King can also be installed on Mac via visualization software. See details in the answer to the FAQ question about Macs.